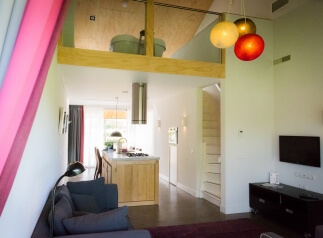 Book a very special, luxurious stay at the lodge rental Het Groene Geheim! From the lodges you’ll have a fantastic view over the landscape garden. There you can fully relax after a long day. There are seven lodges, suitable for 2, 3 or 4 people respectively. They vary in terms of space, style and atmosphere. Five lodges have an open kitchen, equipped with modern devices to allow for the cooking of tasty meals. The bedrooms have luxurious, high quality beds. There is a separate toilet. Furthermore, the lodge features two roofed terraces – perfect for dining, with a great view over the landscape. And each morning a staff member of the lodge rental will bring you a fine, rich breakfast. Of course consisting of wonderful products, locally and organically grown near Almere. Also have a look at our arrangements for an overnight stay, in combination with some activities on the Kemphaan estate. A real forest of course has real dwarfs…but it’s hard to spot them. Come quickly to the special dwarf path on the Kemphaan estate. Looks like the little dwarfs are everywhere! So help the ranger find the dwarf family. Let’s follow the tracks and maybe you see some tiny little footprints in the sand…quiet, I think I can hear them! Pick up your assignment book, the cap and a knapsack full of wonderful sweets at the open air visitors centre of the Almeerderhout. With this fine equipment you can start your dwarf hunt immediately. For each dwarf you find, one task must be accomplished. During the tour you may open the knapsack and eat what’s in it: All the searching makes you hungry, of course! Did you manage to accomplish all tasks? Then you’ll get a beautiful dwarf button at the end of the tour! Are your kids adventure lovers and tough? Then send them into the Almeerderhout forest, together with a ranger from the Dutch forestry. They’ll get back as qualified auxiliary rangers! 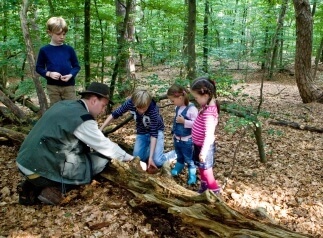 Or walk the activity and explorations path, created especially for kids between 6 and 11 years. 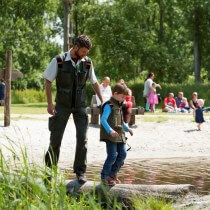 Discover the wonders of the forests together and support ranger Bart with all his tasks. The forest is huge, you know, he can’t do it all alone… During the forest tour the kids get a manual (for auxiliary rangers), a jacket, field glasses and a compass. You can pick these up at the open air visitor centre of the Almeerderhout. 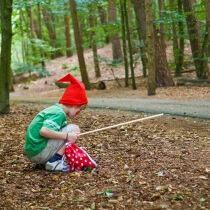 Based on the manual, various tasks have to be accomplished in the forest. Once all of them are done, a little ceremony will take place where the kids will get their official auxiliary ranger diploma! Are you completely done after a day full of walking and discoveries? Too tired or simply not in the mood any more to drive all the way back home? 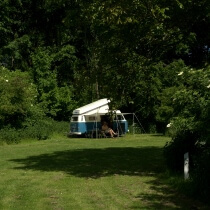 You are most welcome to stay overnight at our natural camping site, on the premises of the Kemphaan estate. Because of the many nice and instructive activities offered nearby, the camping is also especially suitable for kids. They can have a football competition here on the little ball field, hunt for dwarfs in the forest or go and see the apes on the ape islands: Just a few of the many great things to experience here. So quickly book your place at our camping. You will enjoy magnificent sunrise and sunset moments, sitting near your tent at the Kemphaan estate. And while here, give yourself an extra treat, at least once: Rise with the birds and watch deer walking over the camping grounds at dawn! 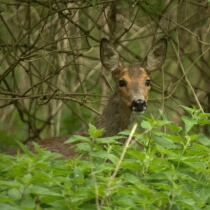 You’ll find more information, also about available places, at the website of the Dutch forestry. The most beautiful hiking routes through the Almeerderhout can be found here. Everything is already clearly marked so that you can fully relax and enjoy the surroundings. Via these hiking routes you will discover the treasures of the Waterlandsebos, the Cirkelbos and the Kathedralenbos. In and around those forest sections, five shipwrecks are located. The Kathedralenbos also features two beautiful cathedrals. And while hiking through the Waterlandsebos you’ll be surrounded by most lovely singing birds. Read on to find out which of the hiking route fits your preferences best!